The AN-FM-240/480-GETH-SNMP is optical transmission equipment based on Application Specific Integrated Circuit (ASIC). It integrates the traditional PDH multiplexer and 1000Mbps Ethernet optical transceiver, and can realize the 8 - 16 E1s and four 1000Mbps Ethernet data channel transmission over optical line of 1.25Gb/s, the four 1000Mbps Ethernet data channel share 1000M bandwidth. AN-FM-240/480-GETH-SNMP consists of a mainboard, two E1 cards and power cards. The line bit rate is 1.25Gb/s, transmission distance is optional (depend on the SFP optical module). SFP MSA(INF-8074i), ITU-T G.695, FC-PI V2.0 standards compliable. Supports 1+1 optical protection and Automatic Protect Switch (APS) with the recovering time less than 50ms. Provides optical loopback function, a great convenience for trouble shooting. Supports Remote Power down Detect (RPD) function, which can be used to distinguish the failures of remote power down or fiber broken. Provides 4/8/16 E1 interfaces, compliant to G.703, and balanced/unbalanced selectable. Jitter tolerance, jitter transfer characteristic and jitter generation fully comply with ITU-T G.823 and G.742 recommendations. Supports device loop and E1 line loop controlled by the local side, which is convenient for E1 line testing. Supports embedded E1 BERT function. One optical Gigabit Ethernet interface and three electrical Gigabit Ethernet interfaces compliant with IEEE802.3 serial standard. The electrical gigabit Ethernet interfaces adopt RJ45 connector, support auto-negotiation, which can work in 1000M full-duplex, 100M full/half-duplex, 10M full/half-duplex mode. The optical gigabit Ethernet interface adopts 1000M SFP module, which can work in 1000M full-duplex mode. 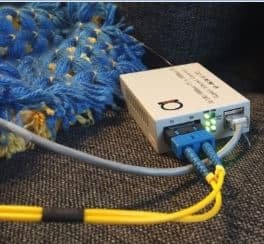 Proprietary technique (patent pending) adopted to prevent Ethernet frames from looping back in case of unexpected optical loopback. Supports unicast, multicast and broadcast frame. Supports flow control and broadcast storm filtering control. Supports MAC address dynamic learning function. Supports port rate control function. Supports port-based VLAN and IEEE 802.1Q tag-based VLAN. Support Redundancy Power Supply Protection, Power Module Hot-swappable, the power consumption less than 12W. -48V DC single power access. -48V DC double power access. 220V AC single power access. 220V AC double power access. -48V DC&220V AC double power access. 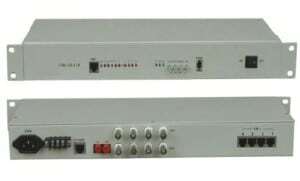 AN-FM-240(480)-GETH-SNMP provides two optical interfaces to implement optical line protection function. The switch time will be less than 50ms. The default switch condition of auto protection is: NOP, LOF or E-6 alarm. Useful for installation and maintenance. Any E1 can be selected for off line test. The performance data includes ：total received packets, total transmitted packets, total received bytes, total transmitted bytes, total received broadcast packets, total transmitted broadcast packets, and the number of error packets. The diagram below shows TX / RX directions of the LAN and WAN ports. Fiber Multiplexer, 8 E1s and four 1000Mbps Ethernet data channel transmission over optical line of 1.25Gb/s, the four 1000Mbps Ethernet data channel share 1000M bandwidth, supports SNMP. Fiber Multiplexer, 16 E1s and four 1000Mbps Ethernet data channel transmission over optical line of 1.25Gb/s, the four 1000Mbps Ethernet data channel share 1000M bandwidth, supports SNMP. The AN-FM-240/480-GETH-SNMP is optical transmission equipment based on Application Specific Integrated Circuit (ASIC). It integrates the traditional PDH multiplexer and 1000Mbps Ethernet optical transceiver, and can realize the 8/16 E1s and four 1000Mbps Ethernet data channel transmission over optical line of 1.25Gb/s, the four 1000Mbps Ethernet data channel share 1000M bandwidth. 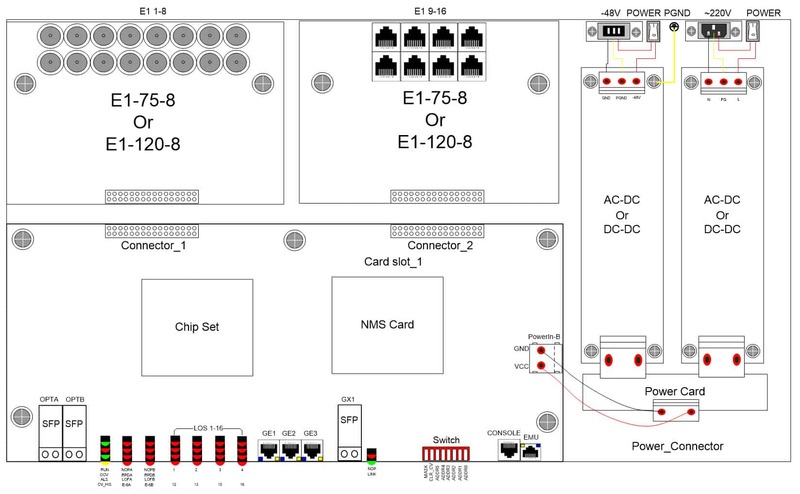 The AN-FM-240/480-GETH-SNMP is designed as a modular system with several optional E1 cards and power cards to meet the various application requirements. It provides one optical Gigabit Ethernet interface (SFP optical module) and three electrical Gigabit Ethernet interfaces (RJ45 connector) compliant with IEEE802.3 serial standard.